Didi's beaded goodies: Blog award and latest needlepoint piece. Blog award and latest needlepoint piece. 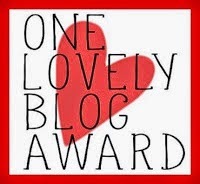 It has been a long while since I have written but recently I was nominated on Lee’s blog for the award below. I would like to thank her and hope that you have time to visit her blog Notes from under the mountain. The purpose of this award is for bloggers to nominate fellow, mostly newer, bloggers that they wish to recognise. The goal is to bring attention to blogs that we think are "lovely" and enjoy reading. We hope others will enjoy reading these blogs also. Thank the person who nominated you & link back to them in your post. · I grew up in the Stratford, have lived overseas for 12 years and came back to Stratford. When I moved home from Melbourne I went the long way around which took nearly six months. · I work in the place that I attended secondary school – Stratford High School. · I started embroidery as a child but knitted and crocheted mostly. I have the first piece of embroidery I made – a linen tea towel with a chef on it. Still used in my kitchen. · My favourite type of embroidery is canvas work or needlepoint and I would live to be able to design pieces. · I started beading in 1991 while in Melbourne and since about 2007 I have designed a beaded Christmas decoration for my night class ladies. My aim is to one day write down and graph out the patterns. Perhaps I will have to give up work to have enough time. · I have decided that none of my work needs to be kept. My three nieces will have far too much stuff to keep all the pieces so in future years I am going to look at selling them. · My stash is never organised but often in a state of organisation. I can usually find what I am looking for but occasionally a surprise comes out and I think I must finish this. I am not certain if any of these people will carry this forward but I hope that they might. These are the blogs that I read for inspiration and encouragement. 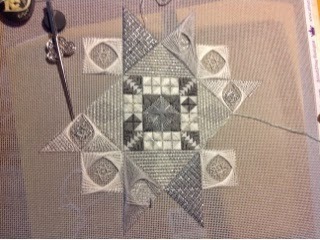 Sharon B – Pintangle blog; an excellent Australian blogger who took a stitch sampler to new heights. Robin Atkins – Beadlust http://beadlust.blogspot.co.nz/ a wonderful beader who does the most amazing work. 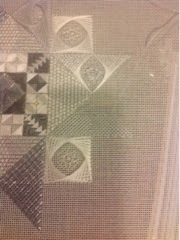 LizArt - http://lizartblog.blogspot.co.nz/ fabulous work on bargello pieces. Latest update on shady colours. This has been a pleasure to stitch and I am looking forward to stitching the next one (green and purple). In the first picture I have nearly completed the Amadeus stitches on the big triangle and in the next picture I have started on the last pair of triangles.